Bedbugs and Lodging Establishments This guide to bed bug identification, control and prevention helps lodging establishments plan for and respond to bed bug infestations. Boil Water Advisory Guidelines Guidelines outlining temporary methods that must be followed in order to continue food service operations during a contaminated water incident. Americans with Disabilities Act Requirements: Service Animals This publication provides guidance on the term “service animal” and the service animal provisions in the Department of Justice's regulations. Licensed Lodging Establishment Rule Current regulations for lodging facilities. Licensed Children's Camp Rule Current regulations for residential children's camps. During the 2018 special legislative session, the Vermont General Assembly passed legislation requiring that all short-term rental operators post a Vermont Meals and Rooms Tax account number on any advertisement for the short-term rental beginning July 1, 2018. This legislation also requires that the operator post in each unit the telephone number of the individual responsible for the unit. The operator also must post in each unit contact information for both the Department of Health and the Department of Public Safety’s Division of Fire Safety. Existing and new operators should review information about the health, safety and financial obligations of short-term rental operators, prepared by the Department of Taxes, Department of Health and the Department of Public Safety. Also available is a self-certification form relating to health and safety precautions short-term rental operators must take into consideration prior to renting a unit. The form must be retained by the operator but does not have to be filed with the Department of Health. A residential children’s camp that is a combination of programs established for the primary purpose of providing an experience for children operated and used for five or more consecutive days during one or more seasons of the year and supervising children for 24 hours a day requires a license from the Department of Health. When did the lodging regulations change? The new regulations for lodging rules went into effect 1/1/2018. I want to do short term rental housing like AirBNB or VRBO. Do I need a license? 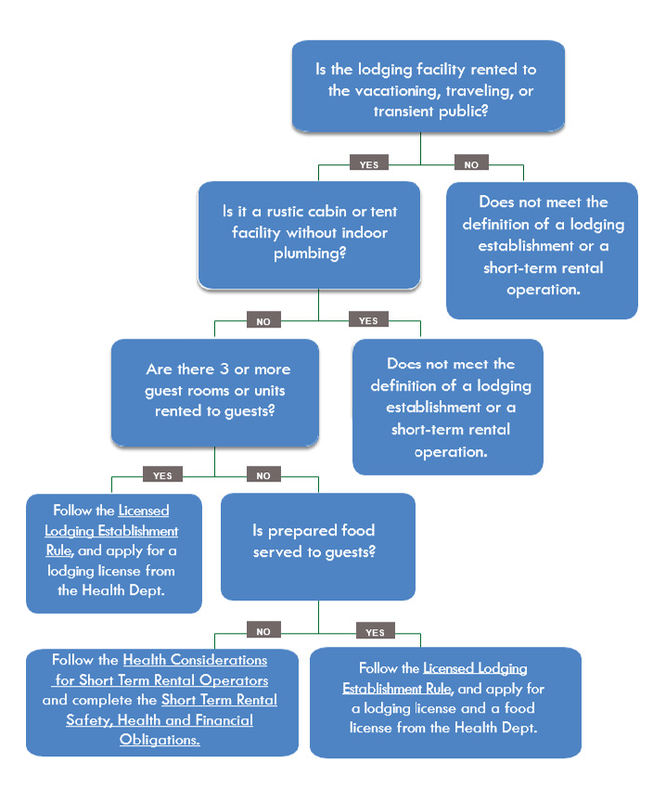 The licensed lodging establishment rule covers anyone offering three or more guest rooms or units of lodging OR fewer units if you are also serving prepared food. If you do not prepare food and you offer one or two rooms for short term rental housing, you must follow the Short-Term Rental Safety, Health, and Financial Obligations but a lodging license is not required from the Health Department. I want to offer lodging but I'm not sure which requirements would apply to me? While most establishments that offer lodging will need a license from the Health Department, some short-term rental housing establishments have different requirements. There are other types of accommodations that don't fit either of these categories. Use the flow chart to determine which requirements might apply to you.